What is your dream date? Dinner in a castle. What is your dream job? To be a Cavalier Girl! Do you have any pets? A Wheaten Terrier, Molly. What is one thing most people would be surprised to know about you? I don’t have my ears pierced because I’m terrified of needles. What is your biggest accomplishment? Becoming a 2017-2018 Cavalier Girl, and graduating from college with my BFA, specializing in two concentrations. What is a failure you learned from? Don’t compare yourself to other people. What famous person (dead or alive) would you like to have dinner with? Misty Copeland because she is a perfect role model, especially within the dance world, for young women. She shows you that you can overcome any obstacle and achieve your goals. What is your guilty pleasure? Dunkin Donuts and any kind of desert. I am most proud of: becoming a 2017-2018 Cavalier Girl and graduating from college with my dream degree. I’ve always wanted to: own a horse. What is your dance background and experience? Fifteen years of studio experience in classical ballet, modern, jazz, musical theater, contemporary, lyrical, pointe, and tap and four years of production in the Philadelphia Thanksgiving Day Parade. To further advance my dance knowledge and technical training, I continued my dance education in college at Mercyhurst University, the Asia Pacific Dance Festival at the University of Hawaii at Manoa, Slippery Rock University, and the American College Dance Festival at the University of Maryland. Why did you decide to audition for Cavalier Girls? It has been my dream job ever since I attended my first Cavs game my sophomore year in college. What do you like most about being a part of Cavalier Girls? 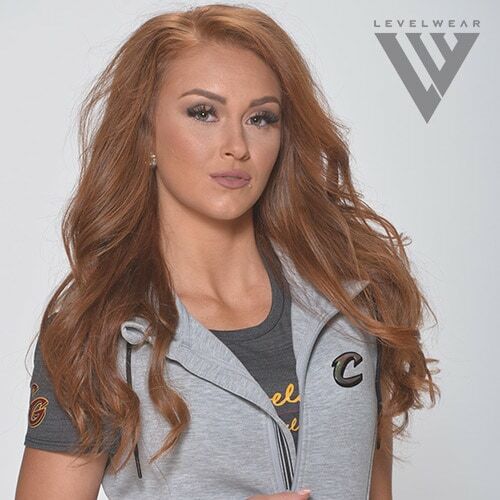 I am a huge Cleveland Cavaliers fan and the fact that I get to represent the Cavs as a Cavalier Girl is amazing. Most memorable Cavalier Girl moment so far? The moment the team was announced at FWD Day and Night Club. If you can say anything to Cavalier fans, what would you say? Thank you for being the most genuine fans! Everyone in Cleveland works so hard for their success, it’s not just handed to them. That’s what makes the team, the organization, and you so great!